Is your Salt actually worth its Salt? From way back when salt has been an important part of many cultures and human health. The Egyptians used it to cure meat and fish and the Chinese counted on it as a means of state revenue. Why it was even a means of payment of wages for soldiers long ago and began the term “worth his salt”. Today it is generously added to all processed foods including lunch meats, soups, bread, and dressings. 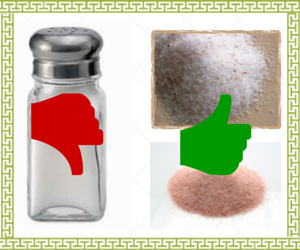 For many of us salt comes in one particular container and can easily be found in almost every restaurant and kitchen across America. Too bad the salt I am describing has been stripped of all of its minerals we require and has gone through a 1200 degree heating process. Often bleached and processed with aluminum and ferrocyanide, it no longer resembles real salt but has become a Frankensalt. Many are concerned they will miss out on iodine if not in their salt but the iodine in the salt is actually synthetic and along with the anti-caking agents can easily prevent our bodies from even absorbing it. Iodine is naturally found in baked potatoes, boiled eggs, strawberries, sea veggies, yogurt, shellfish, fish and there are also supplements. Kosher salt is the exact same but blessed and in larger flakes. Today’s sea salt has often times been through the same process as table salt but not ground down into as fine of pieces and along with the toxins in today’s seas as well as unknown contamination, keeps me from ever suggesting it. Ancient seas located far underground from Pakistan and Utah offer the cleanest best tasting and mineralized salt available today. Himalayan sea salt is pink and full of minerals as is the whiter Real Salt that comes from Utah. Consumption of salt is something to keep a check on but even much more important is to know that processed and restaurant foods, and fast food places use as much as they can and it is of the lowest quality. When cooking at home consider using a real salt, as nature intended, that works to mineralize and nourish your body. Our bodies are mostly salt water, you deserve to have it filled with the very best possible. Learn more in my book Nutritional Truths available on Amazon and very soon on Kindle. Truths you should know about salt!